It’s time for the second of this week’s Out and About, where one of our lucky staff members gets to flee the office for the day and try out one of our experiences for themselves. “This has to be one of the nicest days out I have experienced since being at Red Letter Days. The tour guide was very informative, giving us lots of insight into the history and background of the tennis club and the Wimbledon tournament itself. Obviously, the tour takes place outside the tournament, so it was amazing to see it so empty and eerily quiet. 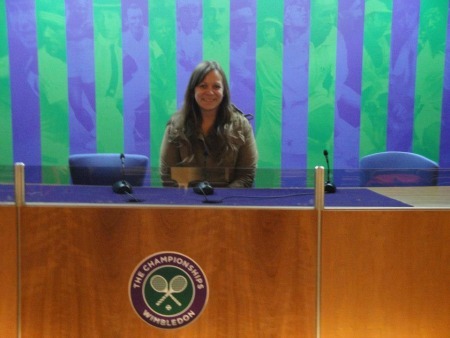 On this tour we got to see things that the members of the general public do not usually get to see, like the press room and player’s area – perfect for cheesy photo opportunities! The Chair Umpire for each match decides whether the players are dressed suitably for the occasion! Perfect for sports fans who dream to experience the exciting stadium atmosphere, would you like to get behind the scenes of a famous sporting ground? Have a look at our selection of top class stadium tours.